As I trudged through the mud in Park Estates with a photographer on a viciously rainy morning recently after we had checked out a house for sale, I remarked that for $2.7 million, you’d think they’d toss in a sidewalk. Turns out that was just another of my typically boorish statements, because in Park Estates, the lack of a sidewalk is one of the trademarks of living in the most elite section of the already-elite neighborhood, where the homes’ greenswards cascade unbroken all the way to the curbside. The home we looked at is currently the highest-price listed home in Park Estates. At $2.695 million, the house, at 1420 El Mirador Ave., is eye-popping when first viewed from the curb, with its handsome facade pitting stone against glass, tucked behind a nursery and a half’s worth of vegetation. The four-bedroom, four-bath house was designed by architect Palmer Powell, whose credits include the striking Grace United Grace United Methodist Church on Third Street and Junipero Avenue. Adding to the prestige (and price) of the 1960 home is the fact that it’s in Park Estate’s “Estate Section,” a collection of 58 homes in the thick of the neighborhood that’s between Atherton Street and El Parque Avenue and between Bellflower Boulevard and La Perla Avenue. “The lots in the Estate are large, many of the homes have tennis courts and there are no sidewalks. If there are no sidewalks, then you know you’re in the Estate,” said longtime Park Estates Realtor Carolyn Faber, who is the listing agent along with her partner and daughter Kristi Faber-Vento. 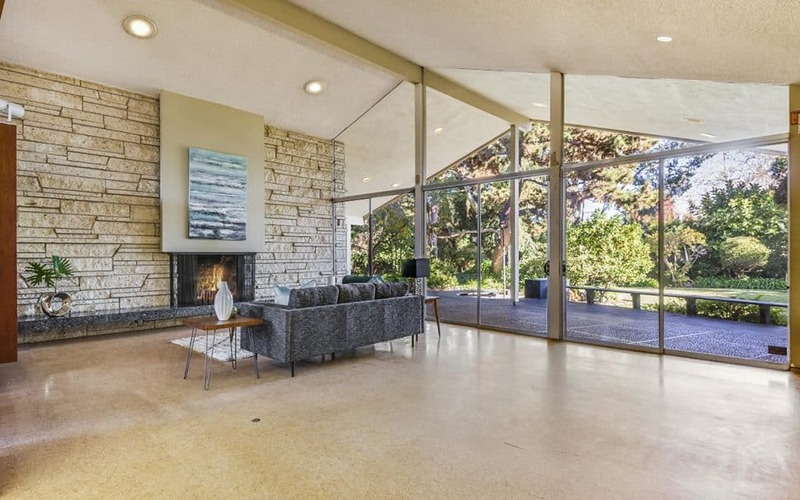 The mid-century modern home was most recently owned by Sally and Eugene Chernoy. The couple opened Sally’s Lamps-Shades on Pacific Coast Highway and the two worked side by side at the shop from 1947 until they retired in 1990. Both have since passed away. The couple lived in the house since buying it in 1964. Though the house was designed as an ideal place for a family with children because of its rare (for the time it was built) open space with the kitchen merging into a great room, enabling a housewife to more easily keep an eye on the kids, the Chernoys had no children and spent a good portion of the year traveling. They had a full-time house woman who lived in the guest house at the back of the property, by the garage. Next to her quarters is a small office that was once used by a full time chauffeur/delivery man. Like other houses in the Estate, the El Mirador property is big enough to hold a handful of houses. The 28,668 square-foot lot easily accommodates the 3,500 square foot residence with enough room left over to hit a bucket of balls with an easy 8-iron. Another tip-off as to the era in which the home was built, is a Cold War-era bomb shelter in the children’s play area in a dedicated alcove in the living room. Kristi reckoned the play area would likely be transformed into a bar, and the bomb shelter would most likely become a wine cellar. Due to a typical mid-century generosity — and Park Estates is brimming with mid-centuries by such giants of the genre as Edward Killingsworth, Richard Neutra and Paul Tay — of floor-to-ceiling glass throughout the house, most rooms have a view of the trees and plants, ranging from a towering eucalyptus tree (which might have to go before its roots swallow up the guesthouse) to ferns and palms. And small meditative courtyards are just outside most rooms in the house. Despite its price, the house is not turn-key. You’re going to need to spring for paint, carpet, some electrical and I’m guessing you’re going to want to upgrade the kitchen and re-pave the crumbling extra-long driveway, a sort of mini-interstate highway that leads up to the garage in the rear of the property. You’re also going to need to buy Windex by the barrel. And if a sidewalk is a deal-breaker for you, keep walking.